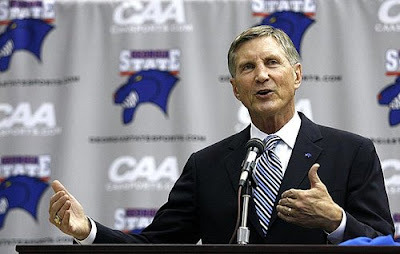 This week, Georgia State University named Bill Curry as its first head football coach. The Panthers will begin play in 2010. Curry, who is 65, signed a 5 year deal with the school. He grew up in College Park, Ga. and played at Georgia Tech. After graduating with a degree in industrial management, he played in the NFL 10 years and was an All Pro center with the Baltimore Colts. After retirement, he was an assistant with the Packers before beginning a 17 year stint as a college head coach. Those years involved jobs at Tech, Alabama, and Kentucky. For the past 11 years, he has been a college football analyst for ESPN. With no equipment, no facilities, no coaching staff. and no nothing, Curry will try to duplicate the success of the late Erk Russell at Georgia Southern. Erk started the Eagles program from scratch and built it into a Division 1-AA powerhouse. That GSU has captured 6 National Championships. From all I've heard about Bill Curry, he is a class act. With that in mind, I wish him well in Atlanta. I hope his gridiron Panthers enjoy success early and often. But Bill, if this is what it took to get you off your television gig, I wish Georgia State had started a football program about 11 years ago!